Instead of a shoe phone, he has a StarTAC. It doesn’t sound impressive now, but in the mid-1990s, it was perfectly respectable—and would not attract undue attention. The man code-named “Black Venus” is known here as Park Seok-young, but many details about his life and mission have been changed in this real-life le Carré-esque tale of espionage, based in part on the deep-cover operative’s notes. 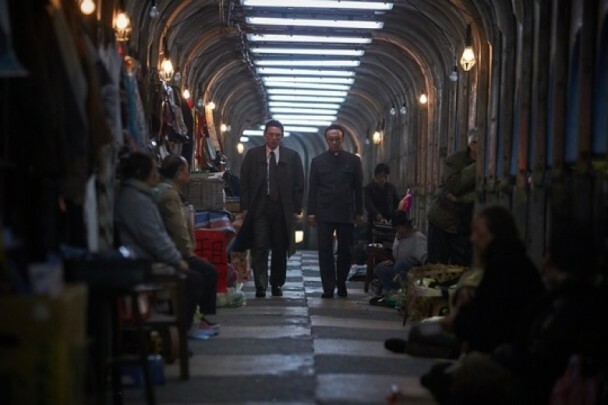 North-South relations are murkier than ever in Yoon Jong-bin’s The Spy Gone North (trailer here), which opens this Friday in Los Angeles (next Friday in New York). Park is a true patriot, who sacrifices a promising career in military intelligence for this long-term mission. After establishing a history of alcoholism and debt, Park turns up in Beijing, posing as a dodgy businessman looking to import profitable North Korean goods via China. However, his real goal is too gain access to North Korea’s nuclear facilities in Yongbyon. It will take a lot of trust-building just to be invited into the notoriously closed pariah state. The plan is to cultivate Ri Myung-woon, Kim Jong-il’s western-educated finance guru, who is primarily tasked with acquiring as much hard currency as he can for the cash-strapped regime. The affable quickly forges a rapport with the more reserved Ri, but Jung Moo-taek, the state security liaison is openly suspicious (and hostile). Nevertheless, Park manages to sell first Ri and then Big Brother himself on a sketchy joint venture to produce commercials in the North to appeal to South Koreans’ nostalgia and desire for unification. It is quite a coup for Park, but it is all jeopardized when his handler, NIS Director Choi Hak-sung changes the mission parameters mid-stream. Suddenly, Park is also supposed to act as a go-between brokering a Wag the Dog incident to benefit the hawkish ruling party in the South. Ideologically, Spy Gone South has a cargo-tanker full of baggage to unpack. On one hand, there is a clear suggestion of Machiavellian moral equivalency between North and South. Yet, it also unambiguously addresses the famine ravaging the People’s Republic during the nineties. It also makes it clear anyone who disappointed the Kim Dynastic regime would be purged and condemned to a prison camp, along with their entire families. In fact, Kim the Second is portrayed on-screen—very much as a wacked-out, unstable, odd duck. It is therefore hard to imagine this film getting much of a reception up North, despite its clearly dovish, pro-unification sympathies. Regardless, on a more basic, formalistic level, Spy Gone North serves as quite a tight, tense espionage thriller, fully stocked with close calls and mounting paranoia. Hwang Jung-min is perfectly cast as the unctuous-on-the-outside, tense-to-the-breaking-point-inside Park, if that is indeed his name. He can radiate a sense of danger like nobody else acting in film today—and as Black Venus, he cranks it up to eleven. Yet, we expect that from Hwang. The real surprise is the depth and uncertainty Lee Sung-min brings to the film as Ri,0 in what might be his career best work. Plus, Ki Joo-bong is so jaw-droppingly amazing as Kim Jong-il, we literally fear for his safety. Park Sung-woong, one of our favorite actors working today (especially in morally ambiguous roles) is weirdly under-utilized as Park’s oblivious South Korean partner in the advertising venture, but just having him on-board is reassuring. There is a great deal of complicated intrigue that unfolds during the film, but even though Yoon never skimps on the Smiley spycraft details, he still keeps the pacing snappy. The takeaway is rather muddled, but it is just a lot of fun to watch the big name cast sneak around, conspiring against each other. 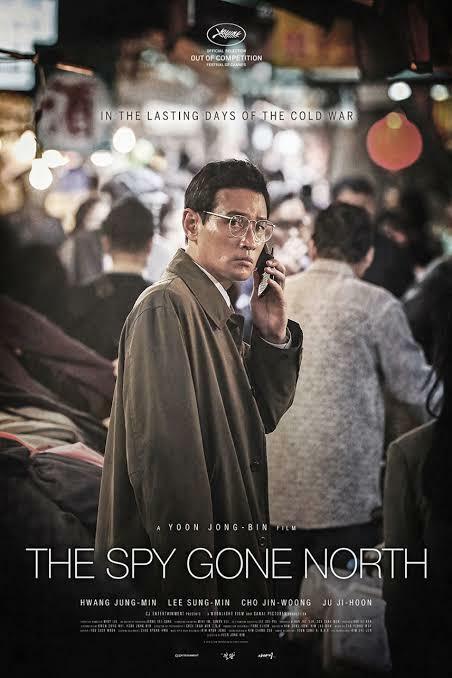 Highly recommended, The Spy Gone South opens this Friday (8/10) at the Los Angeles and Buena Park CGV Cinemas (and next Friday in New York, at the AMC Empire).